Wanted: Crocodile Hunters | Build Your Walls! Guard Your Gates! 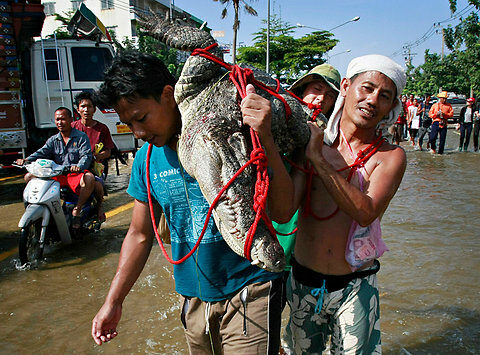 Thailand, where I live, is suffering from the worst flooding in over 50 years. My home in Chiang Mai flooded a few weeks ago, but now the floods are in Bangkok, and most of the city is under water. The three men in this photo apparently believed it, and maybe it was true. The crocodile might have willingly slipped into their restraining system. But I doubt it. He looks really uncomfortable. And he was free! Surely the gastronomic choices outside the breeding farm were much better than the slop he was fed inside. So, assuming that he put up a bit of a fight, do you think the approximately $33 apiece that each of these men earned for risking life and limb was sufficient compensation? Not for this crocodile hunter. If you earn $1 a day $33 a piece is worth the risk to receive this “fortune”. Maybe to those of us who earn more it doesn’t seem worth the risk but for the poor, sometime their situation forces them to do highly dangerous jobs simply to feed their family.